Graciela Socorro was born in Ames, Iowa. She is an American-Venezuelan multi-disciplinary artist based in Houston, TX. She works in photography and mixed media art since 2010. Graciela specializes in nature photography, geometry art and painting. As an award-wining artist, she has exhibited in several juried art shows nationally and internationally. She has gallery representation in New York City, Houston and Venezuela. Graciela got her B.S. in Mechanical Engineering following her love for astronomy and aerospace engineering. However, she began exploring and loving photography since she was little, looking at her father's National Geographic magazines. Many years later, she met Carlos and they began taking pictures together. For Graciela, this moments are magical, an eternal meditation where only matters the connection and the encounter with the subject. This inspiration aroused her interest in conducting various studies in nature; following patterns, colors, shapes and textures. Suddenly it became an everlasting encounter founding her muse in nature. From the beginning, she has received guidance and support from Fine Art Photographers Albert Frangiéh and Carlos Ocando. This encouraged her to continue her studies with geometry in nature. In 2010, Graciela made her first photography portfolio Between Sun & Palms (Entre sol y Palmeras), making her debut in the “6th. Young Artists Regional Saloon at the Museum of Contemporary Art of Zulia (MACZUL)” in Venezuela that same year, followed by Into me I See at ipa. Both projects were made of palms trees where she played with their lines and colors, shadows and light creating geometric patterns using more than one image. She received regional and International recognition from both series. She is still working on a new body of work that will be soon available on her website. In 2012, she decided to express her joy for color and geometry on a new project called Bindu - Sanskrit for dot or point - which is the main shape of the work. The circle represents unity, wholeness, infinity and all colors combined is a celebration of joy and life together. The work is made out of layers of acrylic paint on different medium: hand-made clay sculptures, panel and reclaim objects. When the piece is ready, Graciela applies a layer of non-toxic UV protection resin to obtain a glossy look and protect the paint and clay objects. In 2014 she moved to Houston, TX with her husband the Fine Art Photographer Carlos Ocando and their Maltese Miss Brandy Bigotes. 2016 | Honorable Mention. 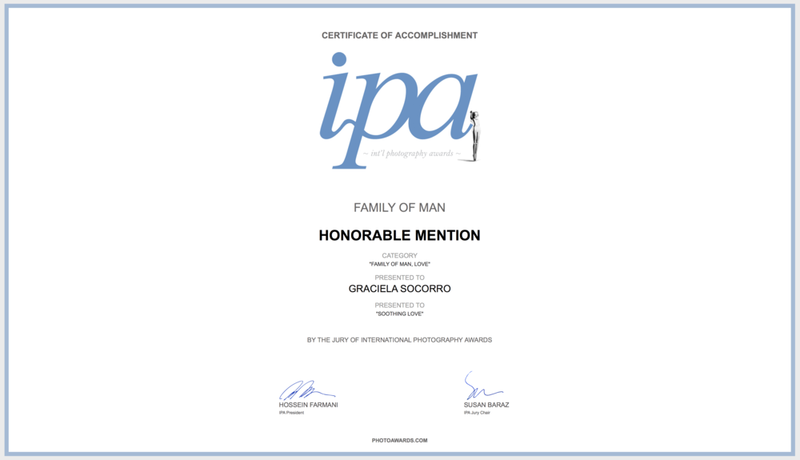 ipa ~ int'l photography awards ~ Family of Man juried competition. New York, NY. 2016 | Winner, Category 0-5 years of experience at “Texas Biggest Ten for Art” juried exhibition. Katy Contemporary Arts Museum - KCAM. Katy, TX. 2011 | Honorable Mention. ipa ~ int'l photography awards. New York, NY. 2011 | Official selection & 1st. Place in “People ́s Choice”. Prix de la Photographie - PX3. Paris, France. 2017 | Lawndale Arts Center's Retablo Exhibition & Silent Auction “30th Dia de los Muertos”. Houston, TX. 2017 | “Subastarte”, Auction supporting the Pediatrics Hospital Foundation. Maracaibo, Venezuela. 2017 | Kirksey Architecture Art+Design month 2017. Houston, TX. 2016 | Lawndale Arts Center's Retablo Exhibition & Silent Auction “29th Dia de los Muertos”. Houston, TX. 2016 | “CraftTexas Roundup" Exhibition and Silent Auction celebrating Texas craft and honorees, Michelle and Frank Hevdejs. Houston Center for Contemporary Craft - HCCC. Houston, TX. 2016 | “CraftTexas2016”, Houston Center for Contemporary Craft - HCCC. Official selection by juror Paul Sacaridiz, Executive Director of Haystack Mountain School of Crafts; Nicole Burisch, Core Fellow Critic-in-Residence at the Museum of Fine Arts, Houston Glassell School of Art; and HCCC Texas Master, Sadie Zilker, Department Chair of Jewelry and Enamel and Three-Dimensional Design at MFAH Glassell School of Art. Houston, TX. 2016 | “Subastarte”, Auction supporting the Pediatrics Hospital Foundation. Maracaibo, Venezuela. 2016 | “Texas Biggest Ten for Art”, Katy Contemporary Arts Museum - KCAM. Category Winner by juror Andrés Bardon, Founder/Editor/Director of The Pictorial Bardon Group, Arte Arteclásica Contemporánea and Museum Magazine; Patricia Covo Johnson, Art Critic and Curator; Ken General, Creative Director of Arts+Culture Magazine, Founder of Duende Art Project and Gallery Manager of BLUEorange Contemporary. Katy, TX. 2016 | "Collective Perceptions". Juried exhibition on Silver Street Studios by Houston artists Gordon Phillipson. Houston, TX. 2016 | “Houston Symphony Ball 2016”, Auction benefiting the Houston Symphony's Education and Community Programming. Houston, TX. 2016 | The Assistance League of Houston “Celebrates Texas Art 2016”, Williams Tower Gallery. Official selection by juror Brady Roberts, Chief Curator of Milwaukee Art Museum. Houston, TX. 2015 | "Deck the Walls", Annual group exhibition at Catherine Couturier Gallery. Houston, TX. 2015 | Lawndale Arts Center's Retablo Exhibition & Silent Auction “28th Dia de los Muertos”. Houston, TX. 2015 | Latin Ladies Foundation of Houston, Silent Auction benefiting their Educational Programming. Houston, TX. 2015 | “New Texas Talent XXII”, Craighead Green Gallery, Dallas, TX. Official selection by jurors Terri Provencal, Publisher & Editor in Chief of Patron Magazine and Barry Whistler, Founder & Director of Barry Whistler Gallery, Dallas, TX. 2015 | “The Big Show”, Lawndale Arts Center's annual juried exhibition. Official selection by juror George Scheer, Executive Director & Co-Founder, Elsewhere, Greensboro, NC. Houston, TX. 2015 | “Subastarte”, Auction supporting the Pediatrics Hospital Foundation. Maracaibo, Venezuela. 2015 | “7th Invitational Exhibition”, Visual Arts Alliance's juried exhibition at Avis Frank Gallery. Official selection by David Hardecker, Founder & Director of Avis Frank Gallery. Houston, TX. 2014 | Lawndale Arts Center's Retablo Exhibition & Silent Auction “27th Dia de los Muertos”. Houston, TX. 2014 | “32nd Juried Membership Exhibition”, Visual Arts Alliance's juried exhibition at 1600 Smith. Official selection by juror Dennis Nance, Exhibition and Programming Director of Lawndale Art Center. Houston, TX. 2014 | “Wanted: Wildlife”, Katy Contemporary Arts Museum - KCAM. Official selection by juror Ana Villaronga, Founder & Director of KCAM. Katy, TX. 2014 | “6 Profiles. Individual Collective”, Art collective at Náutico Club. Maracaibo, Venezuela. 2013 | FIAAM - Maracaibo’s International Art and Antiques Fair represented by Gala Gallery. Maracaibo, Venezuela. 2013 | “Fragments of Time”, Art collective at Náutico Club. Maracaibo, Venezuela. 2013 | “Subastarte”, Auction supporting the Pediatrics Hospital Foundation. Maracaibo, Venezuela. (Graciela Socorro ́s Art got the Second highest bid). 2013 | "2nd Gala Gallery Imaginary Exhibition” supporting the Pediatrics Hospital Foundation. Maracaibo, Venezuela. 2012 | “8th. Young Artists Regional Saloon at the Museum of Contemporary Art of Zulia” (MACZUL). Official selection by juror Oscar Gonzalez Bogen, painter; Luis Cuevas, painter and Fine Art Photographer Albert Frangiéh. Maracaibo, Venezuela. 2012 | “Subastarte”, Auction supporting the Pediatrics Hospital Foundation. Maracaibo, Venezuela. 2012 | “1st Gala Gallery Imaginary Exhibition” supporting the Pediatrics Hospital Foundation. Maracaibo, Venezuela. 2011 | “Fragments of Time 2011”, Art collective at Náutico Club. Maracaibo, Venezuela. 2010 | “6th. Young Artists Regional Saloon at the Museum of Contemporary Art of Zulia (MACZUL)”. Official selection by jurors. Maracaibo, Venezuela.